Alzheimer’s is an incredibly complex disease, and doctors still have quite a bit to learn about it. This progressive disorder can be caused by many different factors, which is why seniors need to follow a comprehensive wellness plan that preserves their cognitive health. Here is a quick look at six steps your aging loved one can take to reduce the risk of Alzheimer’s and many other forms of dementia. A new study carried out at Rush University Medical Center found that the MIND (Mediterranean-DASH Intervention for Neurodegenerative Delay) diet can reduce the risk of Alzheimer’s by 53 percent. The participants who followed this diet also had much lower rates of heart disease, high blood pressure, and type 2 diabetes. The MIND diet focuses on nutrient-dense produce such as kale, spinach, bell peppers, berries, and broccoli. It also limits the intake of inflammatory foods like alcohol, processed sugar, and simple carbohydrates. Helping an aging loved one maintain a nutritious diet can be difficult for family caregivers. Huntsville respite care professionals can assist seniors with a wide array of daily tasks, offering family caregivers the chance to focus on other personal responsibilities or take a break to prevent burnout. Whether it’s for a few hours a day or a few days a week, respite care is the perfect solution for family caregivers who are feeling overwhelmed. A healthy diet should provide your loved one with most of the vitamins and minerals he or she needs. However, your loved one might still experience the occasional nutritional deficiency. Taking a few high-quality supplements can prevent these deficiencies and reduce the risk of Alzheimer’s. Some of the brain-boosting nutrients to look for in supplements include omega-3 fatty acids, lutein, and vitamin E.
One of the most effective ways to reduce the risk of Alzheimer’s is to cut out all tobacco products. According to the CDC, smoking cigarettes increases the risk of Alzheimer’s by nearly 80 percent. Even smokeless tobacco products can have a major impact on cognitive health. The ideal way to quit smoking is to speak with an experienced doctor about a comprehensive treatment plan, which might include options such as nicotine patches, therapy, and mindfulness exercises. A little bit of stress is perfectly natural, but these feelings should never escalate into long-term anxiety. Chronic stress damages many different areas of the brain, which can amplify mental health disorders like Alzheimer’s. If your loved one seems to be stressed, you might want to discuss techniques he or she can use to manage these feelings and emotions. Some people respond very well to holistic treatments such as meditation and group counseling, while others require prescription medications that limit the production of stress hormones. 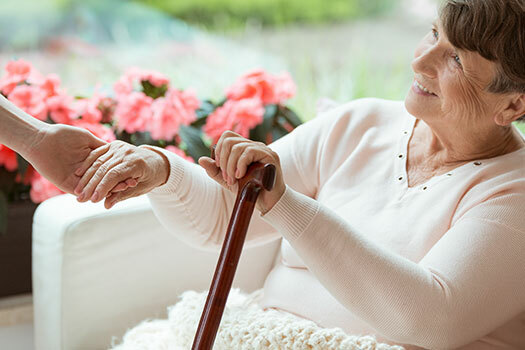 Seniors who need assistance managing stress can benefit from professional in-home care. In Huntsville, home care agencies can be a great boon to seniors. With the help of the caregivers at Home Care Assistance, your aging loved one can lead a happier and healthier life. We offer a revolutionary program called the Balanced Care Method, which encourages seniors to eat nutritious foods, exercise and socialize regularly, and focus on other lifestyle factors that increase life expectancy. The Alzheimer’s Association claims chronic sleep deprivation can double the risk of Alzheimer’s. Sleep deprivation usually takes place when an individual consistently gets less than seven hours of sleep per night. Prescription sleep aids can be useful in some situations, but they should only be a temporary solution. To get plenty of sleep every night, your loved one might need to come up with a nightly ritual such as taking a hot shower, reading for a few minutes, and then getting into bed at the same time. In addition to reducing Alzheimer’s risk, exercising can also boost cognitive health. Older adults should try to get between 120 and 180 minutes of exercise per week, which might include walking around the block, doing yoga, or swimming. Seniors who don’t enjoy traditional forms of exercise should try out dancing, bird watching, or engaging in other physical hobbies. Caring for a senior loved one who is at risk for Alzheimer’s can be overwhelming. Families looking for top-rated Huntsville home care providers can reach out to Home Care Assistance. From respite care to specialized Alzheimer’s, dementia, stroke, and Parkinson’s care, there are many ways we can make life easier for seniors and their loved ones. To schedule a free in-home consultation, give us a call at (256) 716-9940 today.